Ask a New Jersey Bankruptcy Attorney: Should I File Bankruptcy If I am Retired? Many retired persons over 65 and on a fixed income struggle with outstanding debt and have to face the decision over whether to file bankruptcy. The income of many seniors is not going to increase, such as a fixed pension or social security, yet their debt obligations are on the increase. Unexpected events, such as medical debt not covered by insurance or medicare, push those in retirement over the edge and into financial distress. Furthermore, increasing credit card and loan interest on outstanding debt while having only a fixed income can lead to an uncontrollable debt situation. Social Security benefits are protected in a bankruptcy and not even counted toward the median income level when determining whether you are eligible for a bankruptcy. This can be beneficial because it makes the filing of the bankruptcy simpler. Outside of bankruptcy there are also federal laws to protect social security benefits from garnishment. However, if the benefits are deposited into your bank account the creditor may look to levy that account. That court levy leads you to have to file a motion to prove that the funds are only from social security benefits. In a bankruptcy, however, these benefits are totally protected. 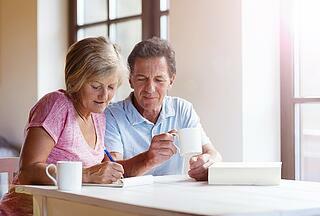 A bankruptcy for a retired person without much income or assets is usually the simplest and most inexpensive type. If you are retired and have questions about whether bankruptcy is the appropriate option, please call a New Jersey bankrutpcy attorney in one of our NJ offices to discuss your situation at 973-870-0434.